How to setup a custom domain for Blogger blog in 2017 with Godaddy for the first time? | TOKITECHIE'S BLOG How to setup a custom domain for Blogger blog in 2017 with Godaddy for the first time? HomeHow ToHow to setup a custom domain for Blogger blog in 2017 with Godaddy for the first time? How to setup a custom domain for Blogger blog in 2017 with Godaddy for the first time? I recently bought a custom domain name from Godaddy.com for my Blogger blog to drop the blogspot sub-domain and successfully redirected traffic from my old blog address to the new address without any problem. I bought the domain name in June 22nd, 2017 and three days after redirecting the traffic from my previous blogspot.com host to the new domain name, I still haven't been experiencing any down times and problems to my blog. When you purchase a custom domain name from Godaddy.com, they assign DNS Records (A record and CNAME record) to the domain. 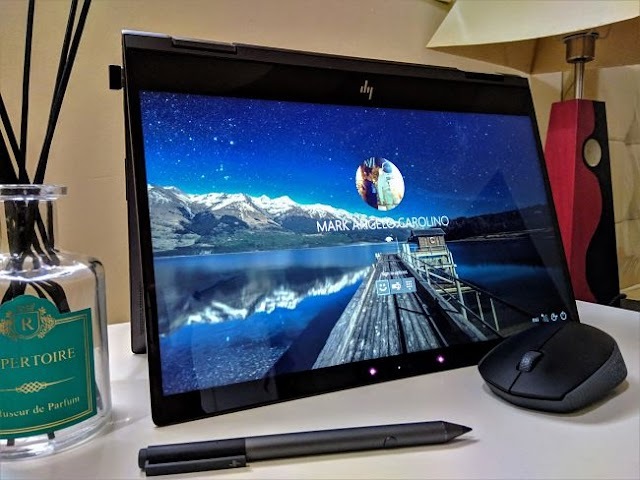 You will use these records to set-up your new website. If you're blogging using Blogger, the default A record and CNAME records provided by Godaddy.com cannot be used so you will have to change it or delete it and create a new one. 1. Sign-in to your Blogger account, expand Settings and click Basic. 2. Under Publishing > Blog Address section, click "+ Setup a 3rd party URL for your blog"
3. Enter the domain name you just purchased from Godaddy.com and make sure that the www prefix is included. Do not hit the Save button just yet. You need to configure the A and CNAME Records on your Godaddy account first before clicking that Save button. 4. Open a new browser window and sign-in to your Godaddy account. 5. Under My Products > Domains, choose the domain name and click DNS button. 6. 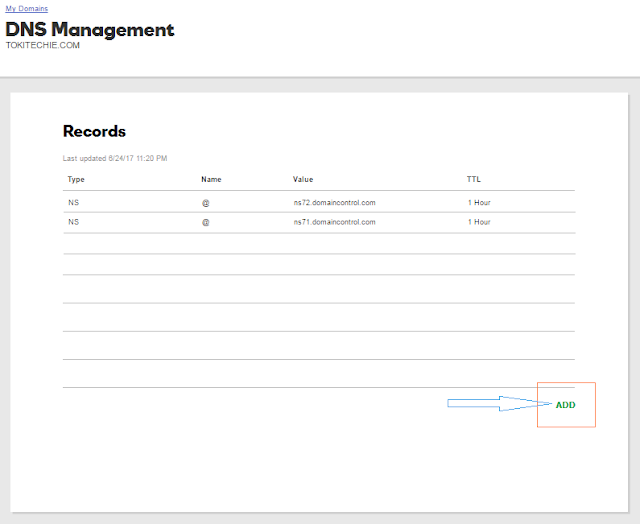 Under the DNS Management > Records, delete the all A records and CNAME records leaving only the two (2) NS records. and put values to "Host" and "Points to" one by one until you finish creating 4 A records. Host "@" and Points to "216.239.32.21"
Host "@" and Points to "216.239.34.21"
Host "@" and Points to "216.239.36.21"
Host "@" and Points to "216.239.38.21"
8. 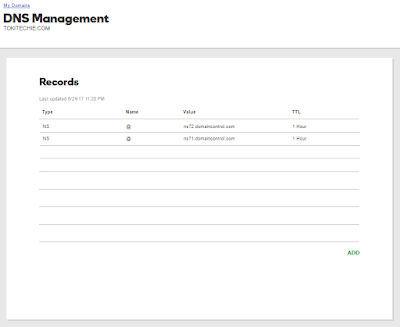 Now, create CNAME records. To do that, you need to go back to your blogger account on the last page where you left it and the click the Save button. After clicking the save button, you will get an Error message. To fix that error, you need to verify ownership of the domain by creating two CNAME records on your Godaddy account using the values generated from your Blogger account. 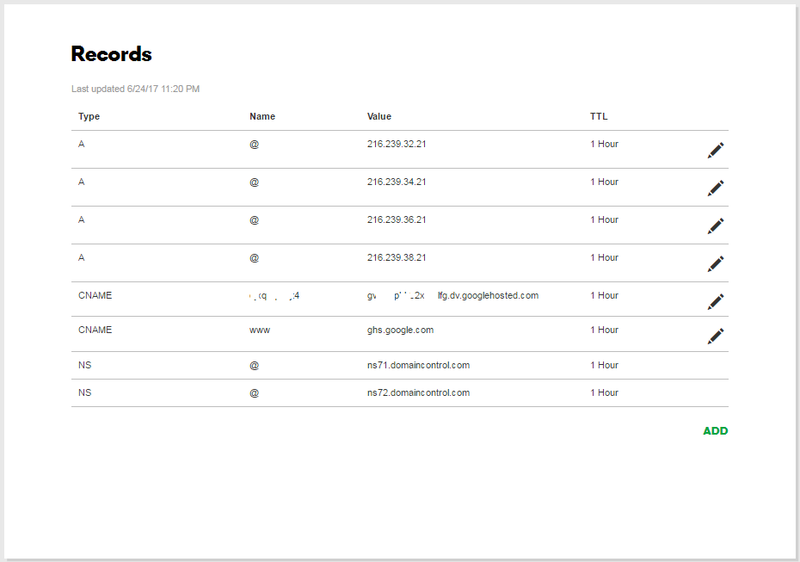 To create a CNAME Record, click the ADD button, select Record Type CNAME, put the generated values for "Host" and "Points to" and hit Save. 9. After creating the 2 CNAMEs and 4 A records, click Finish and Save Changes once again. 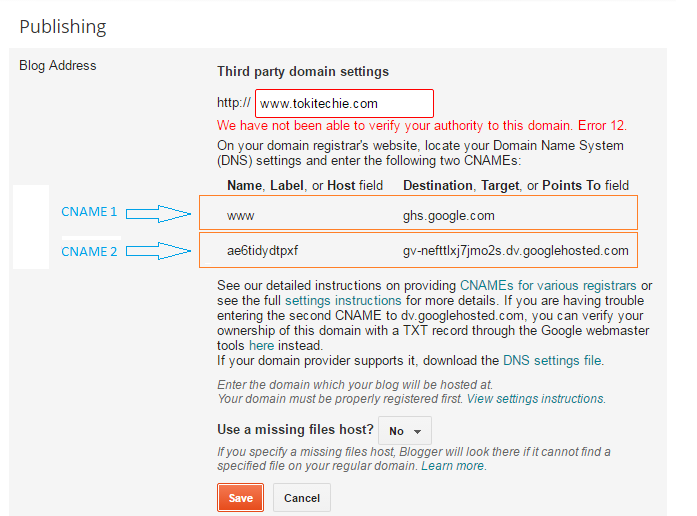 Go back to Blogger and you should now be able to save the third party domain setting without error. 10. For the final step, click on the "Edit" link next to the blog address and tick the redirection option and save the settings once again. Note: The changes to the DNS settings for A and CNAME records can take up to 48 hours to update so if it doesn't work right away, just wait for the settings to take effect by checking back after a few hours. In my case, the changes took effect at once so I was able to immediately browse the web pages of my blog using the new domain name I just purchased from Godaddy!.